Not only is it man’s calling to exercise dominion, but it is also his nature to do so. Since God is the absolute and sovereign Lord and Creator, whose dominion is total and whose power is without limits, man, created in His image, shares in this communicable attribute of God. 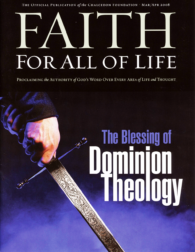 It’s something of a testament to the power of dishonest reporting that so many Christians believe that anyone writing on The Blessing of Dominion Theology must somehow be arguing for The Blessing of Abject Miserable Tyrannical Legalism. Coaching the Next Generation of Dominionists: It’s as Easy as 1-3-2!